We've moved, come by and check out our new showroom @ 1251 W 9th St! Bling Tees! 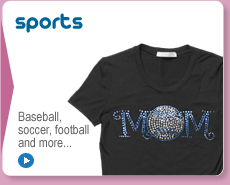 Order custom rhinestone shirts today and SPARKLE with every move! Dazzle your friends and fans with a stunning rhinestone t-shirt creation from Sew Happy. Virtually any design, pattern or 'look' can be enhanced with a customized set of brilliant crystal bling from Sew Happy. 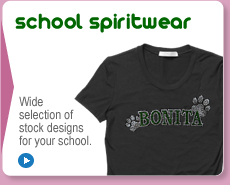 In addition to a wide selection of in-stock, ready to ship designs, the professionals at Sew Happy can turn your school shirts, sports team logo or special event tee into spectacular, eye popping customized visual experience for all to love...and your crystal rhinestones will NOT fall off!! Unlike others, a rhinestone tee from Sew Happy will last and last. 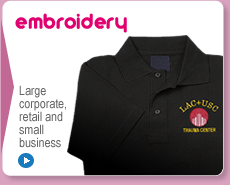 Our unique crystal attachment method ensures that your rhinestones will not pop off and your shirt will not come apart. We use only high quality ultra brilliant crystals and garments from well-known, respected manufacturers. 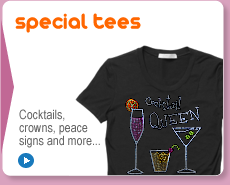 Sew Happy sets the standard for quality rhinestone tee shirts at a price anyone can afford. To get your custom rhinestone order started, call Sew Happy today: (909) 946-4888!